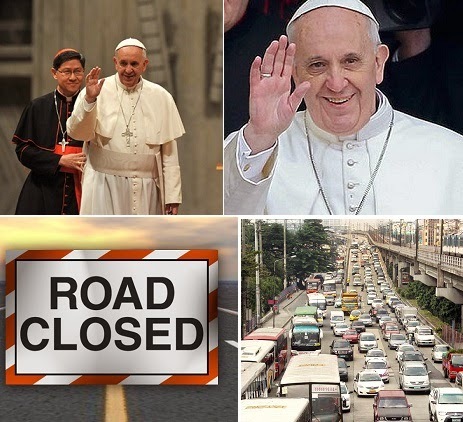 Metro Manila Development Authority announced the closed road and alternate routes during the Papal visit on January 15 to 19, 2015. The country continues to prepare to welcome the Pope and meet him in person as he lands in Villamore Airbase on January 15, 2015. Chairman Francis Tolentino of MMDA had shared that the dry run done on January 12, 2015 had been done for the security of the Pope and asked for the public’s cooperation. The road that will be closed from 6 in the morning when the pope travels to Malacanang Palace are Taft Avenue, JP Laurel, Pres. Quirino Avenue, and Nagtahan. Othe route that will be closed though not in main route are Pre, Quirino Ave, Roxas Blvd, P. Burgos, Ayala Blvd., Finance Road, P. Casal and Gen. Soriano. As the Pope travels to Manila Cathedral at 8 in the the morning, Gen. Solano, Ayala Blvd, Finance Road, P. Burgos, Bonifacio Drive, Anda Circle and Andres Soriano Jr. Other roads are Nagtahan Bridge, Dr. J P Laurel, Guanzon Ave to UN Avenue, Maria Orosa, Finace and Gen Luna St. Finally, towards Apostolic Nunciature, Gen Luna, Soriano Avenue, Anda Circle, Roxas Blvd, Bonifacio Drive, Quirino Ave, and Taft will be closed by 10 am onwards. Other roads are Finance Road and Padre Burgos. Those who will be using the Skyway are reminded that the elevated section of the Skyway will also be closed in certain hours. The tentative schedule of closing will be at 5 pm on January 15, at 4:30 am and 3pm on January 17 and at 8 am on January 19. Pope Francis will be arriving in the Philippines on January 15. Officials are asking for the motorists’ patience and cooperation as the country is preparing for a rare occasion when the head of the Catholic church visits the nation.